Samsung launched two new phones today for the Korean market - the Galaxy Note LTE and the Galaxy Nexus LTE - and both phones feature Super AMOLED HD displays (with PenTile technology). The Note has a 5.3" Super AMOLED 1280x800 stylus enabled display, a dual-core 1.4Ghz processor and a 8mp camera. The Galaxy Nexus is the first Android v4 (Ice Cream Sandwich) smartphone with a 4.65" HD Super AMOLED display (1280x720, curved glass), a dual-core 1.2Ghz CPU, Full-HD video encoding, 5mp camera, NFC, 1GB of RAM and 16/32GB of internal memory. 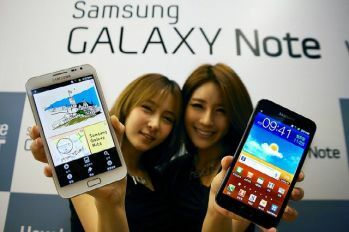 The Galaxy Note's 5.3" HD Super AMOLED display "is as gorgeous as it is enormous"